The Caesar Salad itself is very versatile. 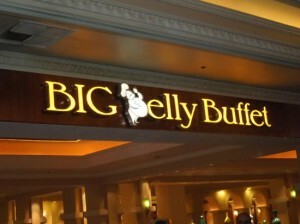 Grilled chicken, baked salmon, seared steak, and “just plain Caesar” salads grace restaurant menus at all levels. My favorite Caesar Salad is topped with tender cooked shrimp. 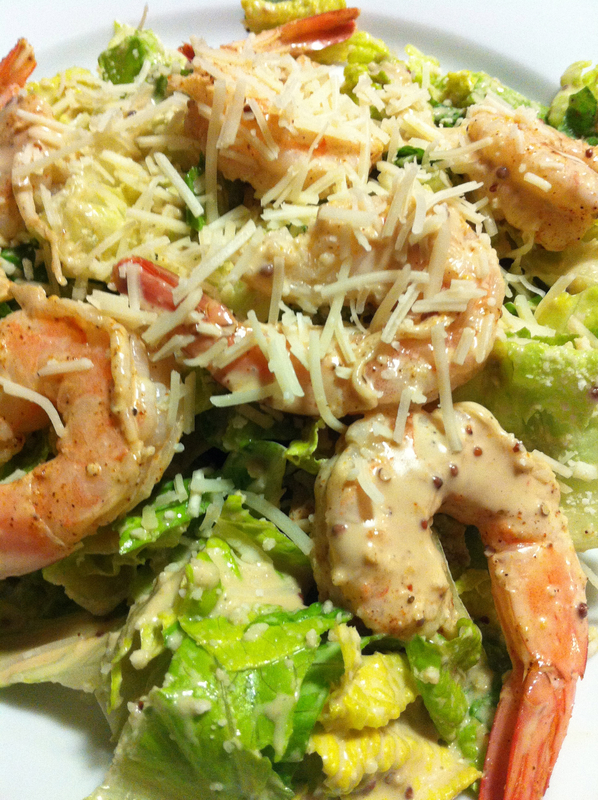 Try my simple Shrimp Caesar Salad as an alternative to your favorite! My husband makes a killer Caesar salad dressing. We generally always have his Caesar dressing on hand, as well as my tarragon balsamic dressing. 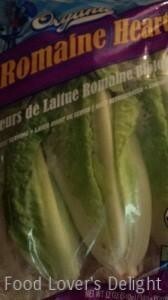 Packages of organic Romaine lettuce keep pretty well in the refrigerator, so I usually have some on hand most days. This Shrimp Caesar Salad is very simple to make. 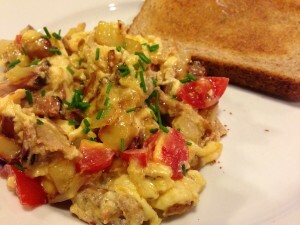 For us, it’s a quick “no-cook” meal in the summer and all year round. This recipe uses pre-cooked shrimp. You can purchase raw shrimp to de-vein, shell, and cook yourself. 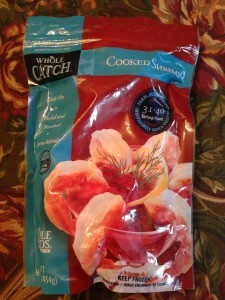 Or, you can purchase pre-cooked tail-on deveined and shelled shrimp at your local grocer. The pre-cooked shrimp is sometimes frozen. I purchase mine in bulk in large packages at my local Whole Foods Market in the frozen section. Be sure to select some nicely sized shrimp for your salads. Wash, dry and chop some Romaine lettuce leaves. Toss the Romaine with my husband’s Caesar dressing and some shredded parmesan cheese and divide amongst your serving plates. Toss the cooked shrimp in a bit of the Caesar dressing. 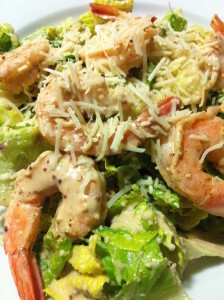 Arrange the shrimp over the dressed Romaine lettuce, and sprinkle on a bit more shredded parmesan. Add some crispy croutons if you like, and your main course salad is ready to be served! 1. With a sturdy kitchen knife, chop the clean and dried Romaine lettuce leaves into bite-sized pieces and put them into a large salad bowl. 2. 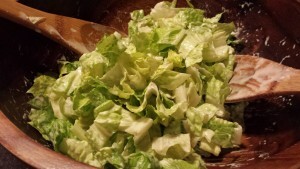 Toss the lettuce with the 1 cup of Caesar dressing and 1/4 cup of the shredded Parmesan cheese. 3. Divide the dressed lettuce amongst four serving plates. 4. In a medium sized bowl, toss the shrimp with the remaining 2 T of the Caesar dressing. 5. Divide the dressed shrimp amongst the four serving plates, 6 shrimp to a salad. 6. 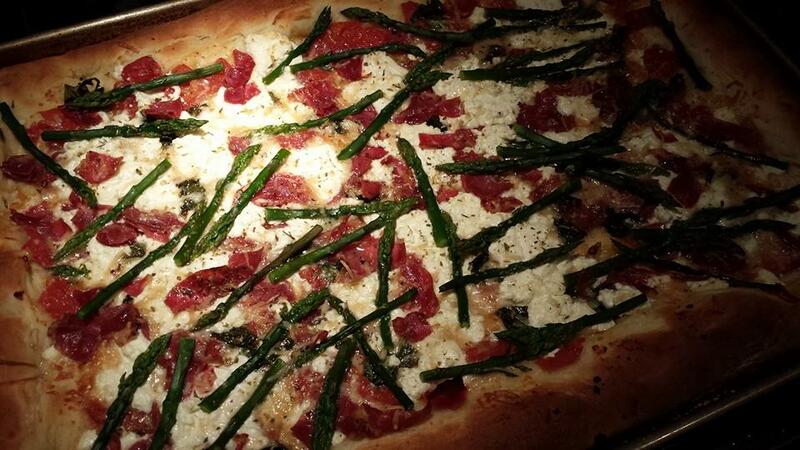 Sprinkle with the remaining 1/4 cup of Parmesan cheese and optional crispy croutons. 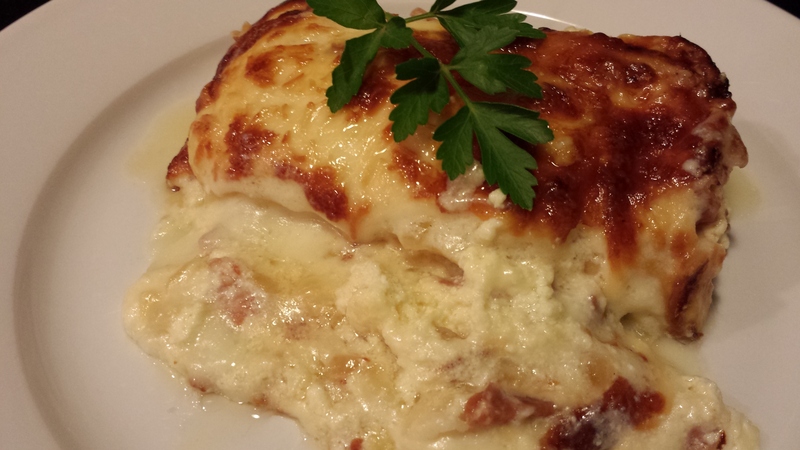 Serves 4 as a main course or 8 as a salad course. Offer with toasty garlic bread and a cup of my Velvety Butternut Squash Soup. Variations: Use a different kind of greens such as red Romaine or perhaps some chopped iceberg lettuce. Add the cooked shrimp “undressed” for a different presentation. Omit the shredded parmesan if you are watching your fat intake. Of course, this is not a low calorie salad! For additional decadence, add some diced avocado to the salad. Avocado is one of my favorite additions and it goes great with the shrimp.